Pushkar in Rajasthan is a favored destination of North India. Hundreds of foreigners throng this place all through the year. The Pushkar fair is an important occassion when tourists flock Pushkar, however it is not only at this time of the year when tourism flourishes. The Pushkar Fair will be held from 12 - 15 November 2005. Pushkar is the flavour of every season. 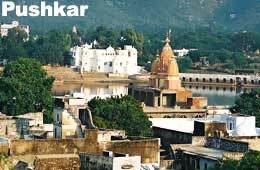 Pushkar is a pilgrimage site and is considered one of the holiest sites in India. The semicircular Pushkar Lake is believed to be extremely holy and has 52 bathing ghats or steps along its banks. Devotees bathe in Pushkar Lake and pray at the Temple dedicated to Lord Brahma nearby. Pushkar is home to the only Brahma Temple in India.